Ok – I have to admit it – I would never, in a million weddings, have thought of using mobiles to add interest to wedding decor. But, after seeing a few featured on creative websites, I’m a believer. Did you have a mobile hanging in your room as a kid? If you’re conjuring up visions of cutesy animals or cars & trucks, think again. These modern mobiles are a stylish, colorful and vibrant. 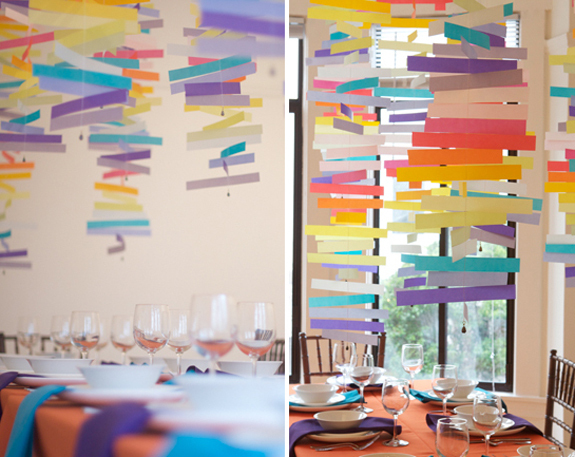 Hang them over banquet tables at your reception or rehearsal dinner for some “wow” factor. I’m willing to bet your guests will be asking “How’d she do it?” after seeing these unique accessories! 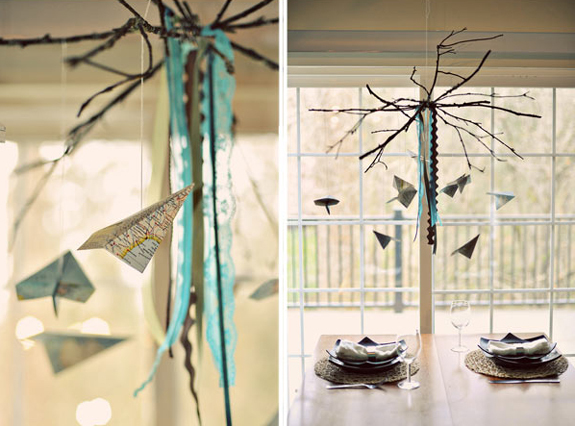 I love these mobiles because they are sweet and delicate, but make such a bold visual statement at the same time. Another bonus? They are inexpensive to make. This entire project was completed for about $25. 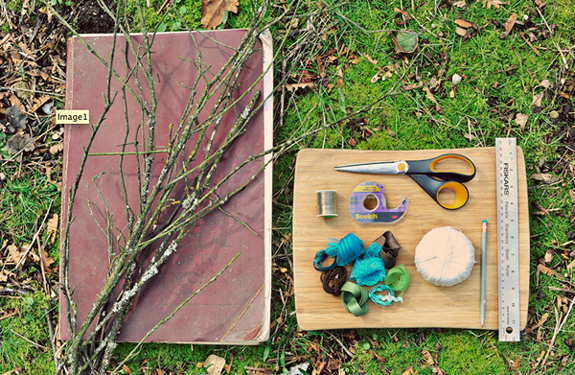 Vellum paper, fishing weights and simple sewing instructions are all you need to get the job done. Click here for complete instructions. Planning a destination wedding? 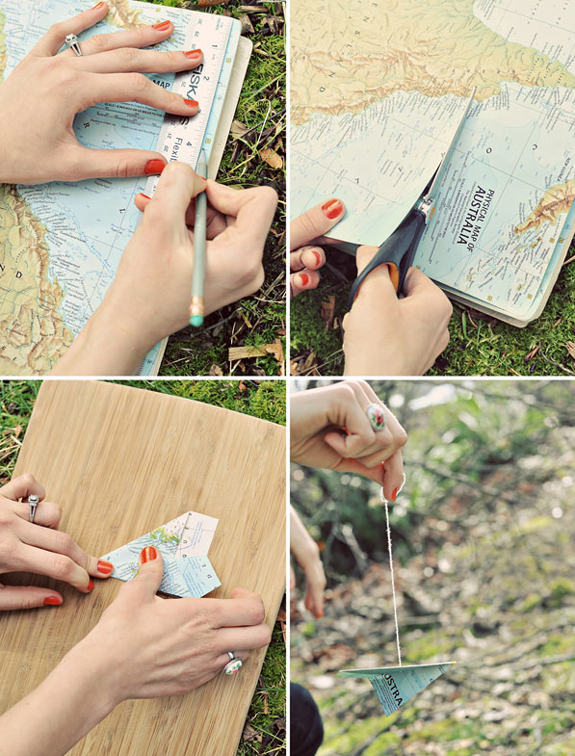 Here’s a super creative idea for a “grown-up” mobile that’s in perfect keeping with your travel theme. Using household items, pliable metal (from your local craft store) and vintage maps bought at a thrift store, this creative bride made a one-of-a-kind statement. Click here for easy instructions. Think you don’t have the time or energy for these fun DIY projects, but want to get the same fabulous look at your wedding? 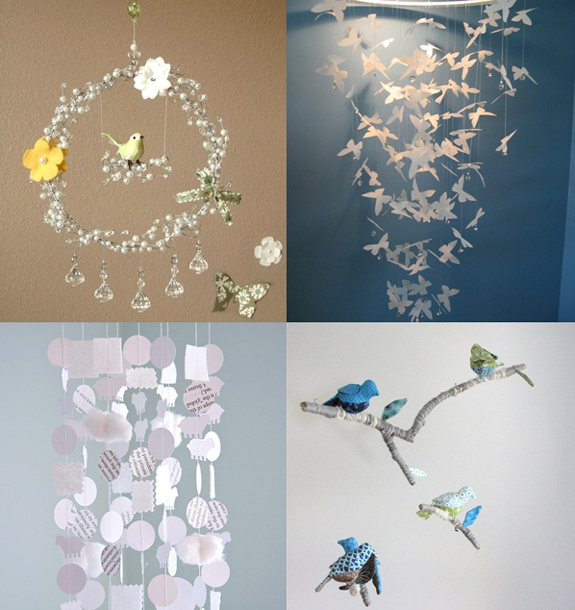 Check out these beautiful mobiles found on Etsy. While they are not inexpensive (these ones range from about $40-$80), they are loaded with style and would be a lovely keepsake to decorate your home together, post-wedding. Either way, mobiles can be a unique way to add yet another personal touch to your special day. Hello, I really like the idea of using an old atlas for the travel inspired mobiles. I’ll get the couples that use our tauranga wedding venue to take a look at this information.